To say that the river is unfishable at these levels is a gross understatement. It’s dangerous, and not just for anyone trying to fish this holiday weekend. Anyone planning on using the river responsibly, (kayakers included) should give it a few days to settle down. 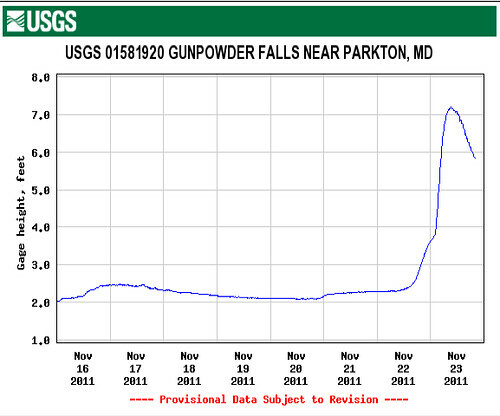 Tuesday the Gunpowder River was flowing at a gauge height of 2.35 FT and 203 CFS. Today, the river peaked at 7.2 FT and 1, 690 CFS. 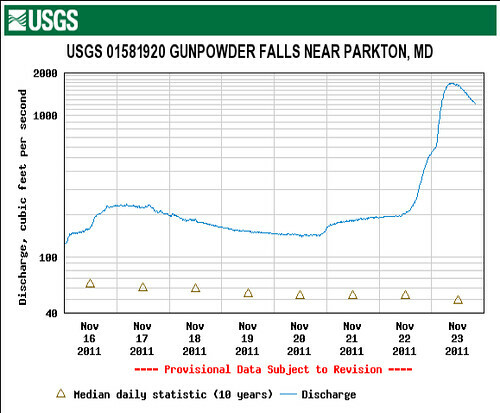 The United States Geological Survey, (USGS) measures the Gunpowder River in feet and flow at the Falls Rd gauging station in Parkton, MD. The top hydrograph shows the dramatic, sudden and dangerous effect that rainfall has on the Gunpowder River when Prettyboy Reservoir is managed by Baltimore City at full pool, (during hurricane season no less) and spillover occurs. The rise in river levels on the top graph is expressed in feet. Floods caused by spillover are disruptive not only for any recreational users interested in spending a day afield but for the wild fish in this nationally recognized tailwater fishery that have been clearing redds in earnest to spawn the next generation. At first glance, during a flood of this magnitude, the river is full of water and mud. Upon closer inspection, the spillover and accompanying high flows that cause dangerous river levels upstream in Gunpowder State Park accelerate erosion by undercutting and destabilizing banks and effect the degradation of downstream waters. The broadest and most fundamental goal of the Reservoir Program is to ensure that the three reservoirs and their respective watersheds will continue to serve as: (a) Sources of high-quality raw water for the Baltimore metropolitan water-supply system; and (b) Areas where the surface waters will continue to support existing environmental, wildlife-habitat, and aesthetic purposes, as well as beneficial recreational uses. The rise in river levels on the bottom graph is expressed in CFS, (cubic feet per second). For perspective, triangles in the lower quadrant of the graph express daily median flows calculated over the past ten years. Today’s triangle represents a median flow of 49 CFS. This entry was posted in news on November 23, 2011 by Theaux Le Gardeur.